Howe, Texas is a small town with a big heart – exemplified by this Boy Scout who produced this sign for his Eagle project. 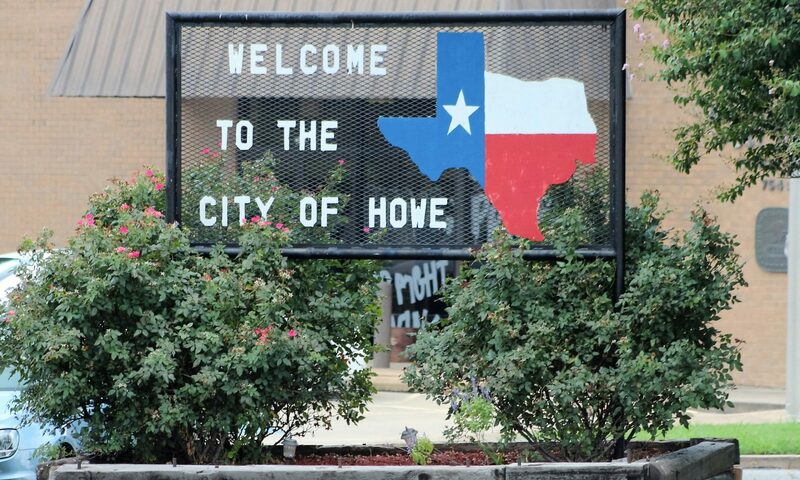 The City of Howe, Texas is located in the fast-growing North Texas area less than an hour from the DFW Metroplex and is conveniently centered around major interstate US Highway 75 with a school district that touches Texas Highway 289. This prime location has Howe positioned for rapid growth as more and more families look to move away from the “big city” and enjoy the benefits a thriving smaller community can offer. The quality schools, interstate frontage, and moderate tax rate make Howe a prime location for new and relocating businesses. SECONDS COUNT IN AN EMERGENCY! That’s why the City of Howe has instituted the CodeRED Emergency Notification System – an ultra high-speed telephone communication service for emergency notifications. This system allows us to telephone all or targeted areas in case of an emergency situation that requires immediate action (such as a boil-water notice, missing child or evacuation notices). The system is capable of dialing 60,000 phone numbers per hour. It then delivers a pre-recorded message describing the situations to a live person or an answering machine in the affected area possibly including instructions requiring action on the part of the recipient. Once the situation is remedied, another call will be placed to the area signaling that the issue has been addressed and that normal activities can be resumed.